This creamy gluten-free seafood dip is the perfect party food and is naturally gluten-free. 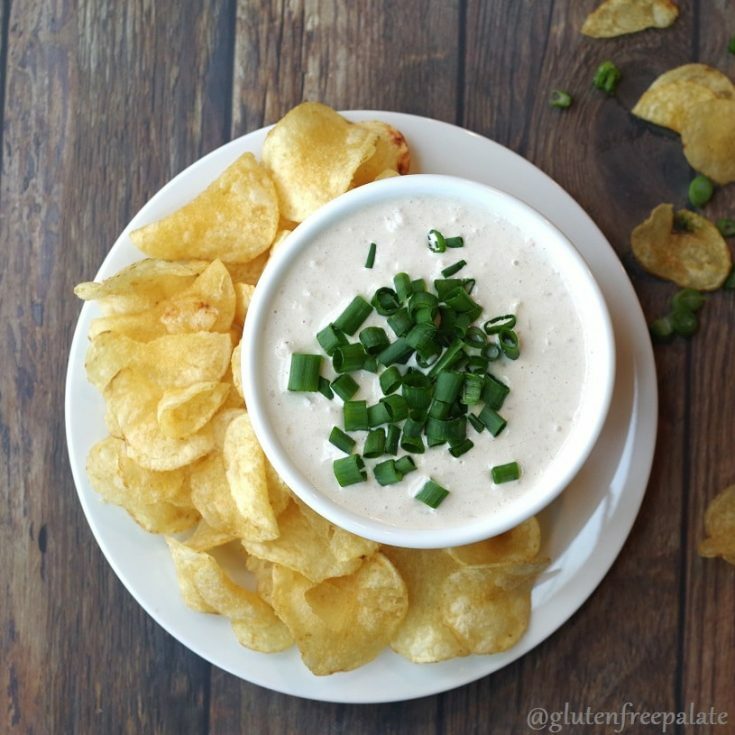 Serve it up with your favorite gluten-free chips or crackers and get snacking! Do you guys like to snack? I do, but I try not to snack unless I’m at a party or a social event. Don’t get me wrong, I’ll grab an apple and string cheese to get me through the morning but I’m not a snacky-snack-foods kind of snacker. You know what I mean? Chips, crackers, and pretzels aren’t part of my daily food-regimen. Not because I don’t like them… It’s because I like them TOO much! I can mindlessly crunch my way through an entire bag of chips or pretzels. And don’t even get me started on dips. There are so many types of dips from sweet to savory, and salty to spicy. Once I get started in on a good dip it’s hard to stop. When I make dips I like to stick to simple easy to find ingredients. I also like to use as few ingredients as possible. 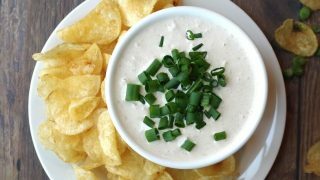 In my opinion a good dip can be amazingly delicious and take less than five minutes to make. This creamy seafood dip is hands down one of the best dips I’ve had and it only requires four ingredients. I love the subtle flavors of crab and shrimp mixed with sour cream and onion dip. This dip is gluten-free, egg-free, nut-free, and grain-free. It’s the perfect match for a salty chip and makes a fabulous party food or appetizer. Looking for more fingers foods and Appetizers? Check out these Sausage and Shrimp Appetizers, and these Gluten-Free Bacon Tomato Cups. Both are huge hits at parties, and both are super simple to make. If you’d love more cold dip ideas, Maya from Wholesome Yum has an incredible Cold Crab Dip Recipe with Cream Cheese. 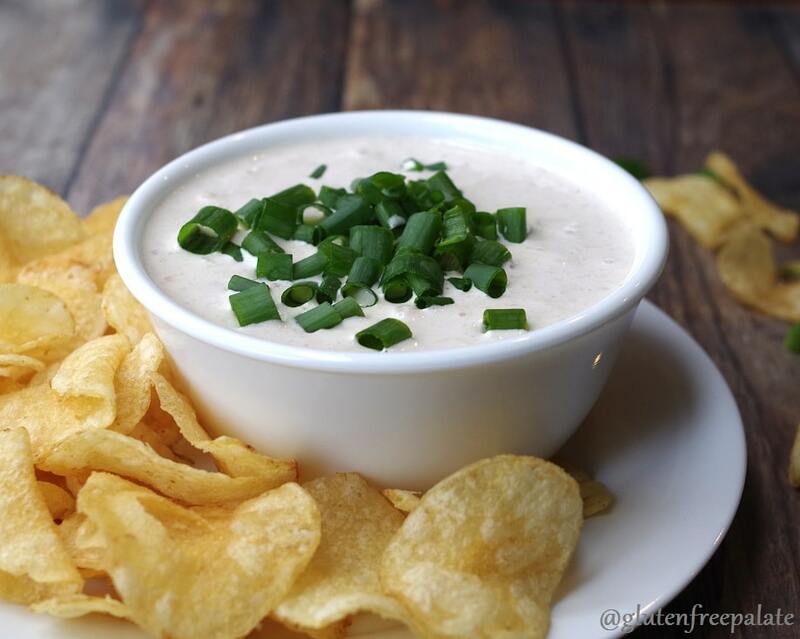 Looking for a hot dip recipe? Try Meaningful Eats Hot Artichoke Dip. This Creamy Seafood Dip is gluten-free, egg-free, nut-free, and grain-free. It's the perfect match for a salty chip and makes a fabulous party food or appetizer. Place all ingredients in a medium sized serving bowl and stir until well combined. Stays good in the refrigerator for up to three days. Sounds wonderful! I just love dips! I will have to make this for all the seafood lovers in my family! It’s so easy to make! And I’m sure they will love it. I’m a huge dip fan, sounds yummy. Thanks for sharing this with us at Savoring Saturdays linky party. Hope you’ll join us again later today.